Nothing makes me more cranky than the care, maintenance and repair of all the electronic devices we all just can’t seem to do without. I’m always on the verge, in the words of author Corey Pein, of going, “full Ned Ludd.” So what do you do when one of these slave labor assembled devices stops working? Yesterday the Apple Trackpad that brings you this blog stopped right clicking resulting in no Monday blog post. Thankfully I found some repair instructions on IFixIt, a handy website that I’ve used many times in the past. IFixIt posts repair instructions for everything from faulty Roombas to cracked iPhones. They’ve even posted directions lifted from Apple’s top secret repair manuals, thereby invoking the ire of the vengeful ghost of Steve Jobs. 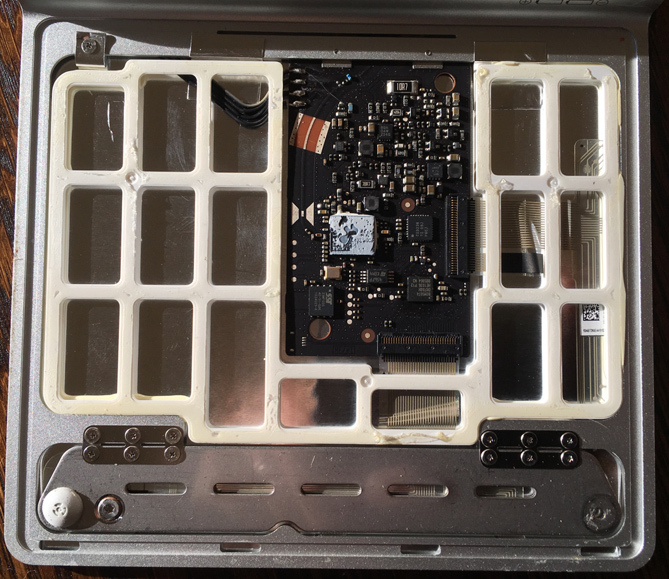 In the case of my sticky Trackpad, IFixxIt’s instructions guided me through removing the back panel and adjusting a screw. It took all of five minutes and this post is proof of success. Suspicious glue gob on CPU chip. But Apple does not make these repairs easy. 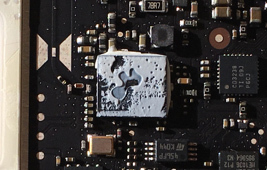 The back has to be pried off carefully since the primary CPU chip of the Trackpad is glued to the back panel. Let me pause here to ask why a manufacturer would attach the back panel to the CPU chip with a wad of glue? Would it be cynical to suggest that they want to sabotage any attempt at repair and get you to spend $120 on a new one? When it comes to repairing electronic devices I’ve found this set of screwdrivers, that I got at the now defunct Radio Shack, handy. 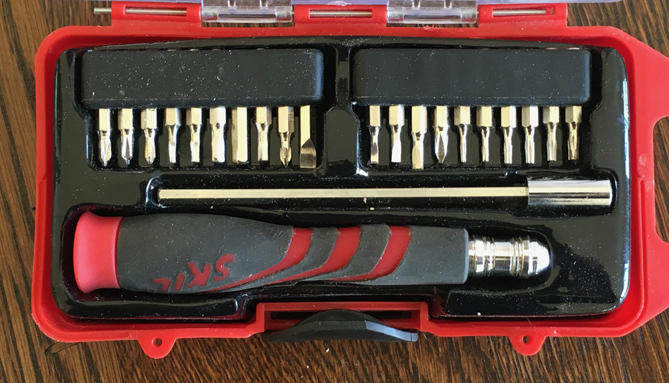 IFixIt sells screwdriver sets like this as well as tools for popping open cases. Thank you IFixIt for disrupting the disruptors! At the risk of an apples to oranges comparison, let me say how much more I like the products of Lie-Neilsen Toolworks. Made in America by workers paid a living wage, Lie-Nielsen manufactures tools built to be taken apart, maintained and repaired by the user. One hundred years from now when the fragmented pieces of plastic from my Trackpad are choking a dolphin, someone will be producing razor thin wood shavings with my #4 Lie-Neilsen hand plane. Drill on left, impact driver on right. How did I spend so many years without knowing the liberating power of the impact driver? How many needlessly stripped screws have abused my patience? How long has the madness of switching bits out on my under-powered drill mocked my home repair progress? Why did I not gift myself an impact driver sooner? A cousin to those “rat-tat-tat” noise-making impact wrenches found at the auto garage, an impact driver is mostly for driving home screws (or a rough hole in recalcitrant wood). An impact driver works like a normal drill up until the point it starts to encounter resistance. At that point an anvil engages to increase torque. It’s not to be confused with a hammer drill, used for drilling holes in concrete and masonry. A hammer drill taps down the length of the bit, whereas a impact driver’s internal hammer is used to increase torque, i.e. rotation. The increased power of a impact driver means fewer stripped screws and less muscle fatigue. The two disadvantages are the need for more expensive forged steel (rather than cast steel) accessories and the fact that impact drivers make a lot of noise. They also only work with 1/4″ hex shank bits and have a collet instead of a keyless chuck. As for the noise, you’ll definitely wake up the night clubbing members of the household if you begin work early. If you’re an urban homesteader type planning to do a lot of chicken coop/shed building type projects I would highly recommend owning both a drill and an impact driver. That way, you can drill pilot holes and then drive the screw with your impact driver without having to constantly change bits on your drill. And the increased power of an impact driver means your arm will be less sore after a day’s work. When my corded drill started to give out I replaced it with a Milwaukee M12 12-volt driver and drill. You can buy these two as a kit or separately. If you’re manufacturing cabinets all day you’ll probably want to go with an 18-volt tool but, for most of us, a 12-volt drill and impact driver is all you need. 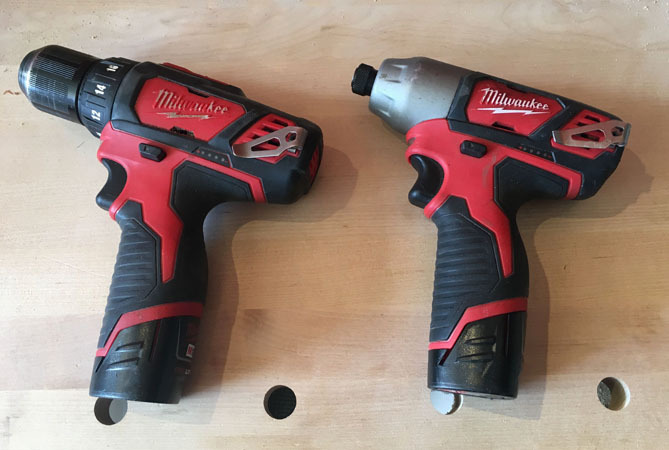 I like the compactness of the Milwaukee M12 even though it means charging the batteries more often. Update: Federico wrote up a blog post showing some of the things we talked about. Federico’s new drill animation piece. Converting an old 3d printer into laser engraver. Federico on the Opposable Thumbs Podcast. Federico’s Warm Heart Automata animated sculpture. Arthur Ganson’s gear piece at the Exploritorium. Paul Sellers woodworker sharpening videos: knife and chisel. Sewing a big bag for bees. Cool Tools knot tying card. Clicker Training for Cats by Karen Pryer. You can follow Federico’s work at WolfcatWorkshop and he’s @wolfcatworkshop on Instagram. Make sure to sign up for his newsletter. Ever try to break up a pallet without splintering the wood? Personally, I’d put this tool innovation above the level of discovering a unified field theory or spotting life on Mars. This DIY pry bar opens a whole world of pallet wood reuse not possible with a crowbar. And it’s another great video from the folks at Garden Fork TV (who thoughtfully include their trial and error and a Labrador break). One of my best allies in my effort to cut down on my use of disposables is a titanium spork. It’s strong, pleasant to use, and weighs virtually nothing. I bought it many years ago in preparation for a long hiking trip, but it soon proved its utility in the urban environment. It’s always in my bag, a permanent part of my “everyday carry”, and I use when I’m eating food from home as well as in situations where I’d otherwise be forced to use plastic flatware. My true spork, the REI Ti Ware spork, is a perfect blend of form and function. While I bought this spork many years ago, REI is still selling a version of it which looks identical, except for having a more prominent logo. 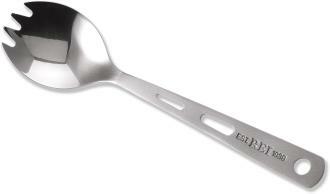 REI no longer carries this particular spork, though it carries other titanium sporks. There’s also a very similar looking titanium spork over at Amazon, produced by Toaks. Some of you may wonder whether I need a knife, and the answer is I don’t need one in most situations. I usually carry a pocket knife, and I can bring that out if I need to slice something like bread or cheese, but 95% of the time the spork alone is sufficient. Also, it’s sturdy and thin edged, so the side of the spoon can cut through softer foods. I’ve heard that back in the day people did not expect to be provided with eating utensils in public establishments, so travelers carried their utensils with them. Today this might seem crazy, but to me, if anything is crazy it’s the idea that we have the God-given right to be provided with a set of plastic flatware which we will use once and only once, for the approximately ten minutes it takes us to down a combo platter, and then consign that set of plastic utensils to an immortal afterlife in a landfill. Meanwhile, I imagine that I’ll request that my spork be buried with me, along with the rest of my grave goods. Addendum: I just found a cool titanium spork, the Apocalyspork, which is more expensive than mine, but is handcrafted in the US out of aerospace scrap. In addition, the handle is tricked up with a bottle opener, a hex key and who knows what else.